Street food has come a long way in the last decade, and attempts to transform it into gourmet delicacy have not slowed down in this city. 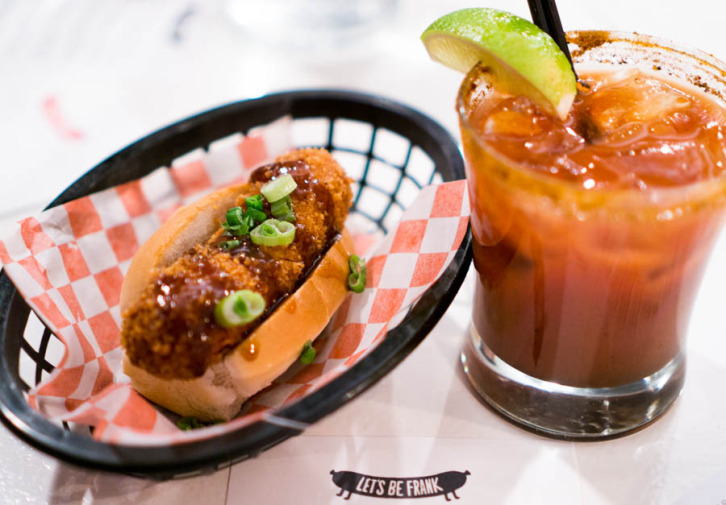 The growing trend of creating elevated fast food, hot dogs in particular, can be found in the newly opened hot dog bar, Let’s Be Frank (460 Spadina Ave.) in Toronto’s Kensington Market. How many ways can you make a hot dog? Well, besides the naked plain dog, Let’s Be Frank offers a dozen gourmet selections of the street meat that have been taste-tested by the owners’ circle of friends. Scoring their franks from the hot dog godfather, Nathan’s Famous, the quality of their dogs is indisputable. We had the pleasure of sampling a few of their fancy creations. My favourite is the Katsu Dog – a twist on the classic corn dog, but coated with a panko batter and deep-fried to crispy perfection. 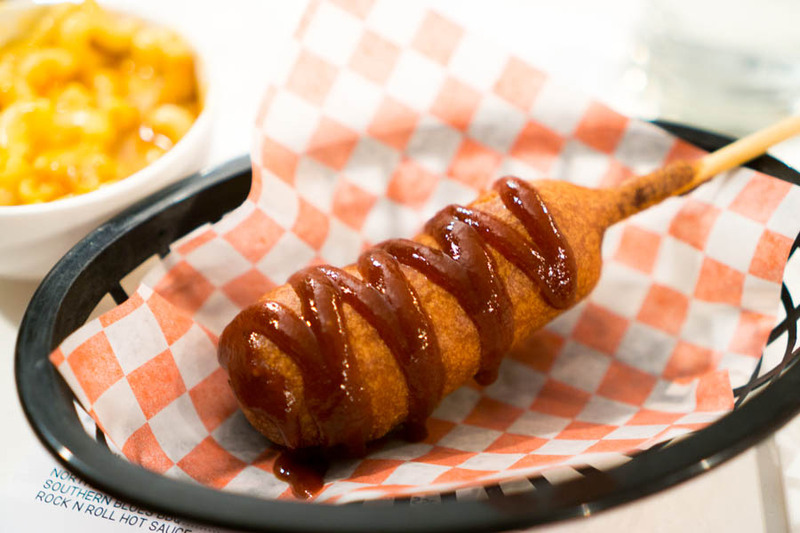 Oh, and their menu also includes a Corn Dog served with a squiggle of the sweet and tangy Southern Blues BBQ sauce. Other specialties include the Tijuana Danger Dog that will blow your taste buds away with its spicy salsa verde from El Trompo, and the Mac Daddy, where a grilled frank is topped with a creamy mac and cheese. If you’re extra hungry and are looking for a meal, try one of their many poutine side choices, like the Northern Soul Pulled Pork Poutine. You can garnish your dogs and sides with any number of toppings, like bacon, cheese, and even kimchi. If you still have room for dessert, the signature Ivana Banana (deep-fried peanut butter, jelly and Nutella “sandwich”) is a sure fix. What I love about Let’s Be Frank isn’t just their multitude of dish options that keep you savouring more, but also their flexibility in the dish sizes. Each wiener dish is available in 3.5” slider, 6” regular, and 8” big dog versions, set with different prices. Hungry patrons can try a few of the smaller dogs at once, without breaking their bank. Let’s Be Frank also provides the flexibility to substitute their buns for lettuce (for the carb conscious) or a bed fries (for carb lovers like myself). A vegetarian version of the wiener is also available for every dish. 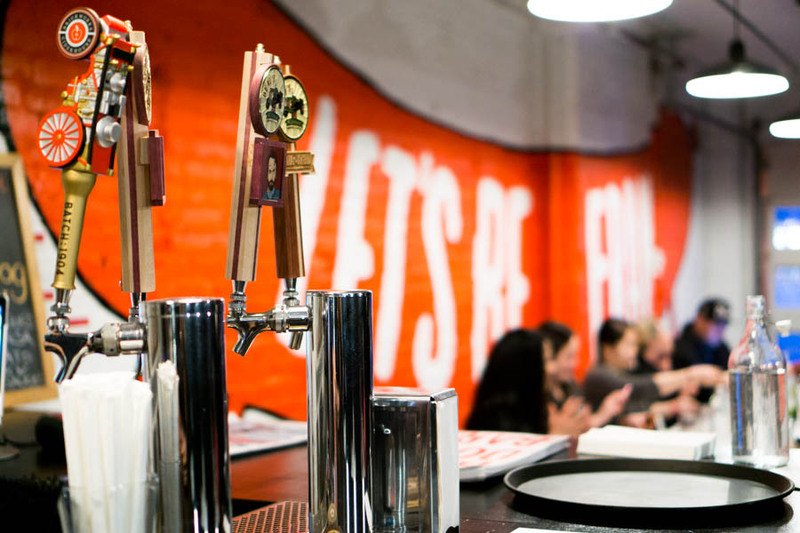 What sets Let’s Be Frank truly apart from other hot dog joints is that they’re fully licensed and serves up a wide range of cocktails, bottled beers, and local craft beers on tap. Their Hot Dog Wings (yes, hot dogs disguised as wings – they really taste like wings!) go particularly well with a pint of Ontario’s flagship Lug Tread Lagered Ale. Let’s Be Frank has been a few years in the making. 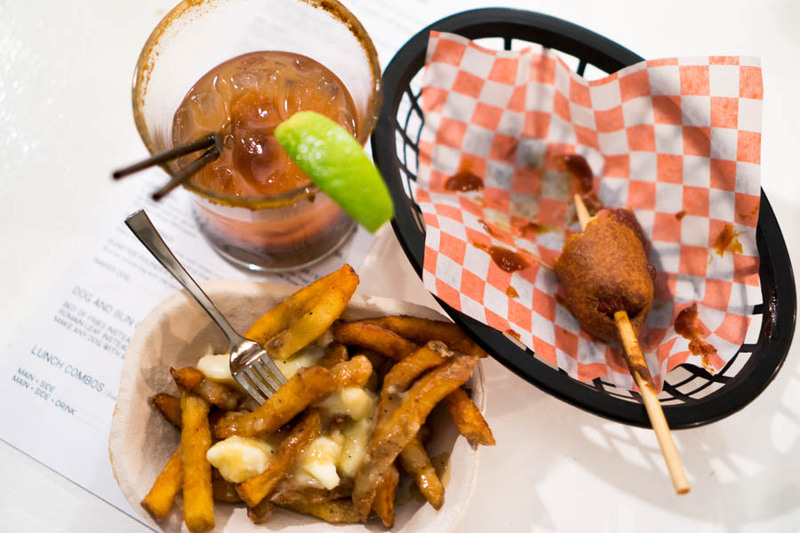 Owners Christa Muio and Simon Colyer spoke passionately about their long journey from their humble food truck beginnings to the pop-up shop on King West (that closed last year), and now finally, a permanent roomy restaurant in Kensington Market. Open until 3am on weekends and with a great location next to the El Mocombo, Frank will catch much of the famished after-party crowd. There is no shortage of seating in the restaurant interior, while a front and back patio will set to open amidst warmer weather. Fun theme nights like B-movie Mondays or Vinyl Tuesdays will also attract fans like myself. Let’s Be Frank offers more than just fast food, its casual and fun pub-like environment will keep customers coming back. Hot dog and ketchup, together at last!